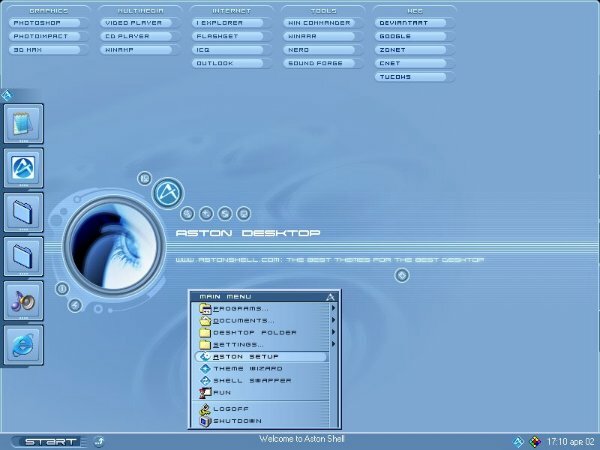 Aston is a Desktop manager and Shell replacement for Windows. It fully replaces standard Windows Desktop and delivers a host of new features: Nice looking, easy-to-change interface, skins for all elements, detailed setup of any element, simple visual configuration, toolbars of any size with plenty of levels, any size & shape icons can be animated, Plug-ins, hotkeys, shell Swapper, and Install & Uninstall. This is the best shell replacement that I have used. It is fully customizable and actually uses less system resources than the default windows shell does. I've tested a lot of desktop managers. On my opinion, Aston is clearly one of the best. You can't install it .. look at it and after 5mn say 'yes it's good' or 'no, it's bad'. You have to make your own settings, use it for several hours or days .. and then .. well you will see that it's a very good piece of software. Very few problems with win32 (never used with Vista) ... unfortunately, the windows x64 compatibility is not perfect. Aston can not be compared with Samurize; clearly not the same objectives. a very nice shell with a lot of features. i think it has a shiny future but the skins are not very beautifull but you can make a lott out of it. sorry for my bad english. You can download themes from internet, you don't have to pay anything about those! HELLO! Good shell however my start button now doesnt work but getting assistance in forum. Lots of themes to choose. This worked fine for me however personally I don't like it, but it does what it says and does it fine. the reviewer below me has no idea what the program does .... its suppose to replace the explorer shell. The best program so far for the people who are looking for the default windows a shell replacement.